A broad term for aromatized and fortified wine. It is flavored similarly to gin with roots sticks, flowers, and barks. China actually can lay claim to first fortifying wine all the way back in 1250 BC (before cocktails) as an ancient stomach relief. Wormwood being a key ingredient and where Vermouth got its name from, the slick French pronunciation of Wermut. There is a ton of history as with anything wine related but I would rather not bore you with it. To make it very simple French vermouth is known as dry vermouth (white) and Italian vermouth is known as Sweet vermouth (red) in most of the world and surely behind my bar. HOWEVER, color really shouldn't be a factor in sweetness or dryness and you can have clear sweet vermouths and dry red ones. Behind the bar, we keep a few different styles including Dolin Sweet, Dry, and Bianco which is one of those lighter sweet clear ones I mentioned earlier. Also, when making a manhattan or a Negroni most bars reach solely for the thick and syrupy Italian Carpano Antica. Over time I feel that Carpano sits flat in a cocktail. Surely a manhattan should be about the Whiskey? The great thing about vermouth is being able to drastically change a cocktail by changing your vermouth. Finding those perfect combos for whiskey and sweet vermouth or gin and dry are as close to “mixology” as I like to flirt. Along with vermouth there are plenty of other fortified wines to enjoy and use in cocktails: Port, Sherry, Madiera, and many others. It does make sense that people are scared of Vermouth. The comical bow to France or wave of a bottle makes sense when you think of how crappy drinks taste with vermouth that has been sitting on a back bar for months. We understand now how to keep it so make sure to trust a bartender when he asks how you take your vermouth cocktails. Odds are he counted the books down the night before and had a glass of the stuff to make sure it was still worth using. 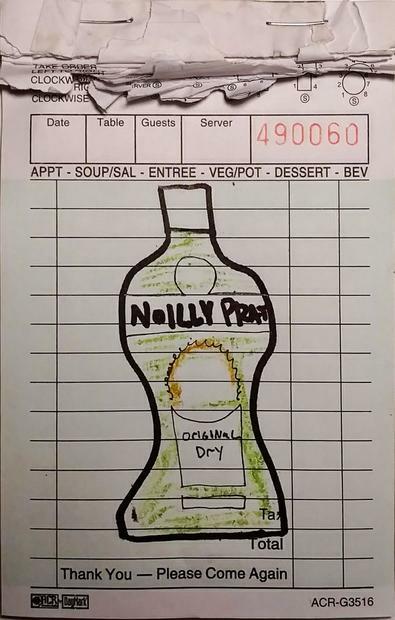 For your house, I would recommend keeping my personal favorite Noilly Prat Extra Dry and Cinzano Rosso for your sweet. I also like to keep a bottle of Martini Dry around. You can find these in smaller .375 ml bottles and I recommend that because they will go bad just like wine does. You also need to keep these in the fridge (I hope you made space) to insure their lifespan a little longer. If you taste it after it has gone bad, it is great for cooking with. Use it like you would use wine...that is what it is. I mix Cinzano with ice and soda all the time for a quick pick me up. I would also stock a Manzanilla Sherry for pre dinner sharpeners and it pairs fantastically with sailing as I found out a few years ago. When picking wine to go sailing with the only options are actually rum, canned beer, or Champagne. If you can't get that drunk, don't want to get filled up, or can't afford a nice bottle of bubbles sherry is the next best thing and will keep you from going overboard in all those categories. I also like keeping a bottle of Lillet Blanc around for its slightly acid kiwi notes on the rocks and for the important roles it plays in cocktails like a Corpse Reviver #2. A great book on this subject is The Mixellany Guide to Vermouth & Other Aperitifs by Jared Brown and Anistatia Miller. Give it a read.